I just sort of unconsciously move cold stuff around in my mouth to avoid getting the cold tooth buzz. I don’t really have to think about it. The one that sneaks up on me is when it’s really cold out and someone tells a joke. That smile with a quick inhale is automatic chill mouth. Book 5 is spending the night in Ohio so it looks like Wednesday will be the official last day for FREE sketches. Order your copy today! That aught be a trope right up there with eye scream. Ever had mouthwash and then gone outside with a smile on your face in the winter? It feels like your teeth are about to shatter. Strangely enough, I have never experienced this. Nor brainfreeze. Is it really that common an occurrence? I thought we’d seen the last of Biff’s teeth. Having sensitive teeth is common enough to have a special toothpaste marketed toward them, I guess. Personally, I don’t have this problem either. ya know how things contract and expand acording to temperature? Drink a hot cup of coffee then freezing icecream and BAM exploding teeth! @Rifpit – you will only know that for CERTAIN if he dies… and stays that way. Of course, Biff being immortal and a robot and all, that will never happen. Right? RIGHT?! …Biff’s teeth are ain a lot better shape than mine. Then again, I’m going through a spell where I like 5 teaspoons of sugar in my tea. VERY sweet teeth, I have. They give me presents on my birthday and walk my dog. Just see Biff when that zipper gets stuck! I saw the first Twilight only, but I do have pointy canines. So there. 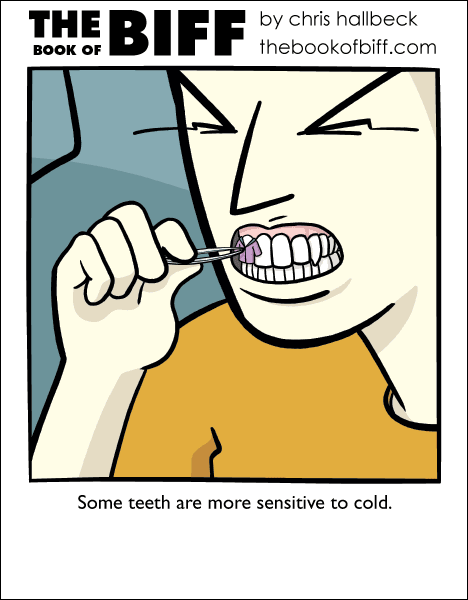 I also had sensitive teeth once, but don’t now. My dentist explained one cause may be receding gums, so better brushing may help. But harsh brushing may also cause gums to recede, so consult your dentist, people. Four/5 will clean the teeth and not charge extra for specific advice. Haha, coat week, looking forward to seeing more varients. Also, it’s coat weather here, but I’m not wearing one. @Stranger I also never get BrainFreeze, but I occasionally suffer from what I’ve termed SpineFreeze, which is a result of too much cold stuff traveling through my esophagus. My whole spine gets that painfull sensation you experience in a cold tooth, and also causes my reflex to bend my back backwards. So I tell you, My experience makes people think I’m crazy when I’m drinking a slushie and suddenly bend over backwards in pain. This morning I put on my coat for the first time this season. Fortunately, there was no half eaten sandwich. Alas, there was no cash either. I’ve got a fang! I’ve got a fang! I’ve got a fang! Glistening white, triangular tooth, open up a can of tomato juice. @Micah: And promptly shatter said tooth on metal can trying to open it. Oddly, the only times I’ve had brainfreeze is when I have a slushie from Sonic. Mmmm, Blue Coconut Powerade slushie.